Distinctive detailing such as a palladian window, covered porches, and prominent gables give this relaxed farmhouse special refinement. Interior accent columns distinguish the inviting two-story foyer from the dining room. A spacious great room is set off by two-story windows and opens to the kitchen and breakfast bay. Throughout the first floor, nine foot ceilings add volume and drama. The master suite is secluded downstairs and features a space-amplifying tray ceiling. The master bath includes a double bowl vanity, garden tub, and separate shower. Storage abounds with roomy linen and walk-in closets. Upstairs, two generous bedrooms have ample closet and storage space. 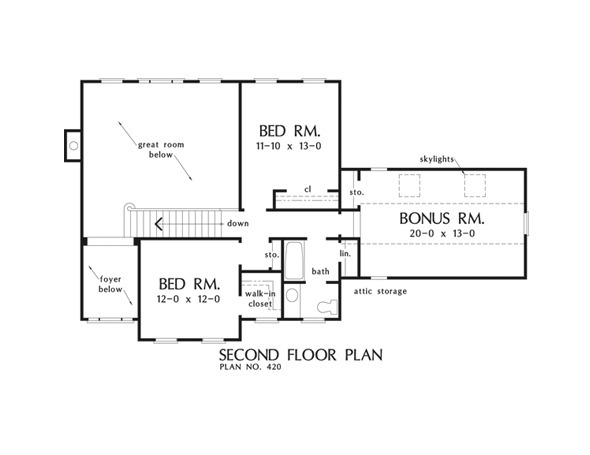 The skylit bonus room enjoys second floor access. 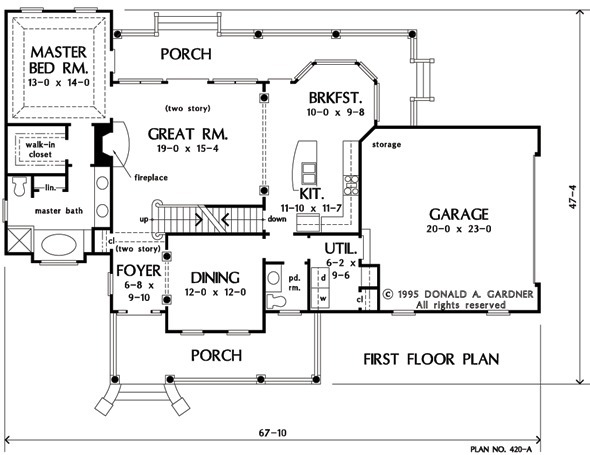 1st Floor: 1436 Sq. 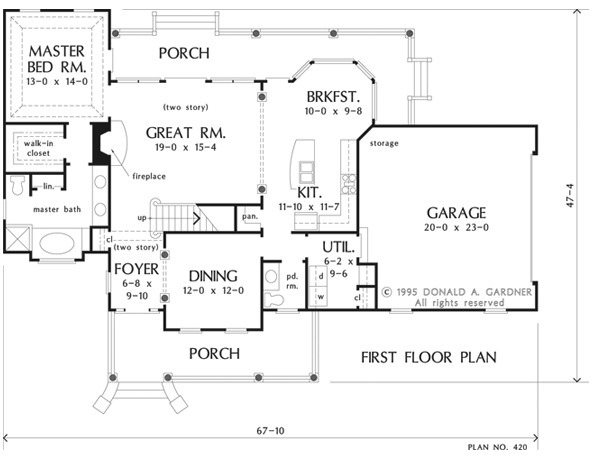 Ft.
House Dimensions: 67' 10" x 47' 4"
Great Room: 19' 0" x 15' 4"
Foyer (2 Story): 6' 8" x 9' 10" x 18' 11"
Great Room (2 Story): 19' 0" x 15' 4" x 18' 0"
Kitchen : 11' 10" x 11' 7" x 9' 0"
Utility Room : 6' 2" x 9' 6" x 9' 0"
Bonus Room (Vaulted): 20' 0" x 12' 11" x 8' 0"
Garage : 20' 0" x 23' 0" x 0' 0"
Bedroom #2 : 11' 10" x 13' 0" x 8' 0"
Porch - Front : 26' 8" x 6' 6" x 0' 0"
Porch - Rear : 38' 6" x 6' 6" x 0' 0"
Storage (Bonus) : 2' 0" x 4' 7" x 0' 0"
Storage (2nd Fl.) : 1' 2" x 3' 8" x 0' 0"